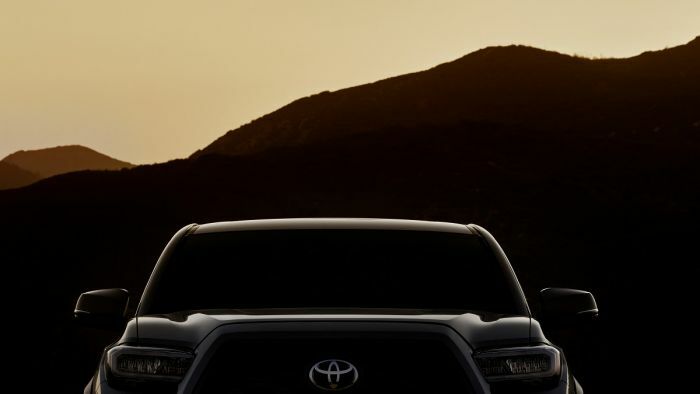 Toyota has announced in a teaser press release that the new 2020 Toyota Tacoma will be revealed next Thursday, February, 7th. This is a not a totally new generation of Tacoma. We are fortunate to have a great Toyota contact, so we reached out to Toyota spokesperson, Corey Proffitt. He told Torque News that the new 2020 Tacoma will come with "improvements and updates customers have requested." This is actually a key point. The Tacoma is one of the most beloved trucks in the market, as reflected by its number one standing as the vehicle with the single best resale value in the country. However, not all is perfect in Tacoma-land. Owners of the automatic transmission trucks have been having difficulties and it is marring the otherwise strong reputation the truck has earned. Toyota could re-tune the transmission shift points and eliminate this problem. There are other less significant areas that Toyota can improve upon as well. Infotainment would be the first area this Tacoma fan would like to see improved upon. Android Auto is not presently part of any Toyota offering, but Toyota tells us that it has not forgotten the approximately 50% of adult phone users who opt for Android phones in the U.S. (Thet percentage is more like 80% in other markets). Toyota could also update the seats in the Tacoma. Although seat comfort is very subjective, many reviewers complained that for them the seat is too low. Rather than a chair, in which one's legs bend at the knee, the Tacoma has one's legs out more flat than in other vehicles. We will be sure to cover the updates. Check back in a week. What changes will you be looking for in the new Tacoma? I must be the only Taco owner who likes the auto trans. Bought a '16 AC OR new and it shifts just fine. As for the low seats, don't hold your breath thinking Toyota is going to raise the height. As our high school physics teacher said, 2 objects cannot occupy the same space at the same time. Toyota is not going to lower the floor pan because it's an off-road vehicle. They're not going to raise the roof because that would mean a major redesign and would hurt gas mileage. As a 60ish someone, the first thing I look at is the seat height and the ease at getting into and out of a vehicle. And that seat height makes a difference in long distance driving too. Toyota, raise the seat!!!! I have two friends that have different recent generations of the Tacoma. Those seats are way too low for comfort. So I agree, that Toyota isn't gonna do anything about those seats. I had an '07 GMC Sierra pickup and currently have a '17 Chevrolet Silverado, both 4-doors. I love those seats, so comfortable. Why?.....the seat height is as natural as sitting in a chair at home. BTW, the GMC has 212,000 miles and runs great!! A relative has the GMC now. Toyota, the news isn't all bad. My '09 Corolla has 176,000 miles on it and is still running well. Factory oil filter and Mobil 1 synthetic every 5,000 miles (per factory specs) keeps the motor humming. I can remove the oil filler cap on the valve cover and look down into the engine. Can't see much, but the top of the engine is just as clean as the day I bought it. I wouldn't have believed it had it not been my vehicle. Toyota had issues with some engines' oil gelling (thickening). This caused engine damage for which Toyota got blamed. As a result of this, on my '09 Corolla, the "maintenance light" on the dash flashes for a few seconds at start-up then turns off. This begins at 4500 miles. At 5000 miles the "maintenance light" stays on constantly. There was also an information card in the glove box addressing oil gelling and strict adherence to the 5000 oil change. I grew up in an era where 10w-40 was the oil of choice for vehicles. As far as taking a deep breath, I did that when I put 0w-20 in my Corolla. The 2019 Camry uses 0w-16 weight motor oil. I suspect the new RAV4 will use that weight oil since its powertrain is similar to the Camry's. The latest motor oil rating is SN Plus. This is to address issues that can cause engine damage, especially those small engines running turbos. On my Silverado I use the OLM as a guide as to when to change my motor oil. I change it around 10% which translates 6000 to 6500 miles. Since the vehicle is still under warranty, I change the oil per manufacturers specs. I use 0-w-20 weight oil as that is what Chevy recommends. As you said, motor oils have been improved over the years. Totally agree. As far as the lighter weight oils go, that is to help manufacturers meet CAFE standards. I do notice on Mobil 1 containers that whenever they make a claim about their motor oil, they use the 5w-30 motor oil as their reference oil. I wish they would use a 20 weight oil to base their claims on since it reflects where the industry is today. Thanks for the post, Jesse. I think you replied to a spam comment that we quickly removed. We'd like to leave up your comment above though since it does relate to Toyota products. If you prefer, we can delete it. Let us know.